By incremental training we mean that after each update, the recommender does not perform a complete re-training using all data, but only a brief update procedure taking into account the update and only a subset of the existing training data. This interface does not prevent you from doing a complete re-training when implementing a new class. This makes sense e.g. for simple average-based models. This interface assumes that every user can rate every item only once. Implemented in MatrixFactorization, UserItemBaseline, NaiveBayes, ItemKNN, UserKNN, UserAverage, GlobalAverage, ItemAverage, and IncrementalRatingPredictor. It is up to the recommender implementor to decide when a prediction is useful, and to document it accordingly. 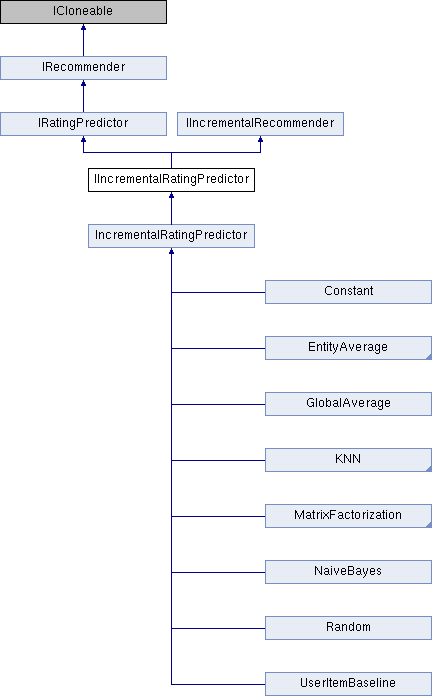 Implemented in Ensemble, ExternalItemRecommender, ExternalRatingPredictor, BiPolarSlopeOne, Recommender, SlopeOne, Constant, GlobalAverage, UserAverage, ItemAverage, and Random. Implemented in BPRMF, MatrixFactorization, BiasedMatrixFactorization, BPRSLIM, CoClustering, LeastSquareSLIM, SVDPlusPlus, UserItemBaseline, FactorWiseMatrixFactorization, SigmoidCombinedAsymmetricFactorModel, MF, SigmoidSVDPlusPlus, BiPolarSlopeOne, SigmoidItemAsymmetricFactorModel, SigmoidUserAsymmetricFactorModel, KNN, KNN, MostPopular, NaiveBayes, SlopeOne, SLIM, MostPopularByAttributes, Recommender, EntityAverage, Ensemble, WeightedEnsemble, GlobalAverage, ExternalItemRecommender, ExternalRatingPredictor, Constant, Random, Random, and Zero. Implemented in BPRMF, BiasedMatrixFactorization, LatentFeatureLogLinearModel, LeastSquareSLIM, MatrixFactorization, TimeAwareBaseline, FactorWiseMatrixFactorization, GSVDPlusPlus, MF, UserItemBaseline, CoClustering, NaiveBayes, SVDPlusPlus, SLIM, SigmoidCombinedAsymmetricFactorModel, MostPopularByAttributes, SigmoidSVDPlusPlus, SigmoidItemAsymmetricFactorModel, SigmoidUserAsymmetricFactorModel, Ensemble, MostPopular, BiPolarSlopeOne, ExternalItemRecommender, ExternalRatingPredictor, ItemKNN, ItemKNN, UserKNN, SlopeOne, WeightedEnsemble, Constant, UserKNN, GlobalAverage, UserAverage, ItemAverage, Recommender, Random, Random, and Zero. Implemented in WeightedEnsemble, and Ensemble. Implemented in BiasedMatrixFactorization, BPRMF, MatrixFactorization, BPRSLIM, LeastSquareSLIM, MF, IncrementalRatingPredictor, IncrementalItemRecommender, MostPopular, and ItemAverage. Implemented in MatrixFactorization, UserItemBaseline, NaiveBayes, ItemKNN, UserKNN, IncrementalRatingPredictor, UserAverage, ItemAverage, and GlobalAverage. Implemented in BiasedMatrixFactorization, MatrixFactorization, LeastSquareSLIM, MF, MostPopular, IncrementalRatingPredictor, IncrementalItemRecommender, and UserAverage. Implemented in BPRMF, MatrixFactorization, BiasedMatrixFactorization, BPRSLIM, CoClustering, LeastSquareSLIM, SVDPlusPlus, UserItemBaseline, FactorWiseMatrixFactorization, BiPolarSlopeOne, SigmoidCombinedAsymmetricFactorModel, MF, NaiveBayes, SigmoidItemAsymmetricFactorModel, SigmoidUserAsymmetricFactorModel, SlopeOne, KNN, MostPopular, KNN, SLIM, Recommender, MostPopularByAttributes, EntityAverage, Ensemble, WeightedEnsemble, ExternalItemRecommender, ExternalRatingPredictor, GlobalAverage, Constant, Random, Random, and Zero. The ToString() method of recommenders should list the class name and all hyperparameters, separated by space characters. Implemented in BPRMF, BiasedMatrixFactorization, SVDPlusPlus, MatrixFactorization, SigmoidCombinedAsymmetricFactorModel, CoClustering, BPRSLIM, SigmoidItemAsymmetricFactorModel, LeastSquareSLIM, TimeAwareBaseline, SigmoidUserAsymmetricFactorModel, LatentFeatureLogLinearModel, FactorWiseMatrixFactorization, UserItemBaseline, SigmoidSVDPlusPlus, SocialMF, NaiveBayes, WRMF, KNN, KNN, MostPopular, TimeAwareBaselineWithFrequencies, SoftMarginRankingMF, Recommender, ExternalItemRecommender, ExternalRatingPredictor, WeightedBPRMF, MultiCoreBPRMF, and Constant. Implemented in BiasedMatrixFactorization, TimeAwareBaseline, BPRMF, KNN, MatrixFactorization, KNN, LatentFeatureLogLinearModel, CoClustering, BiPolarSlopeOne, FactorWiseMatrixFactorization, Recommender, BPRSLIM, Ensemble, SlopeOne, UserItemBaseline, LeastSquareSLIM, TimeAwareBaselineWithFrequencies, SVDPlusPlus, GSVDPlusPlus, SLIM, NaiveBayes, SigmoidCombinedAsymmetricFactorModel, MF, MostPopularByAttributes, SigmoidItemAsymmetricFactorModel, SigmoidUserAsymmetricFactorModel, SigmoidSVDPlusPlus, MostPopular, ExternalItemRecommender, ExternalRatingPredictor, MultiCoreBPRMF, WeightedBPRMF, WeightedEnsemble, Constant, ItemKNN, UserKNN, GlobalAverage, UserAverage, ItemAverage, Random, Random, and Zero. Gets or sets the maximum rating. Gets or sets the minimum rating. Set to false if you do not want any updates to the item model parameters when doing incremental updates. Default should be true. Set to false if you do not want any updates to the user model parameters when doing incremental updates.